Material deprivation is a non-monetary measure of poverty which measures ownership of durable goods considered valuable by a society for a good standard of living. The CRRC’s 2010 Caucasus Barometer provides a limited assessment of material deprivation by measuring household ownership of nine durable goods in South Caucasian homes: TVs, DVD players, washing machines, refrigerators, air conditioners, cars, landline telephones, cell phones, and computers. 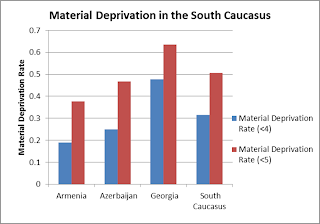 The results indicate a great deal of variety in levels of material deprivation by country, but show that material deprivation is mostly prevalent within rural areas and among the poorly educated in the South Caucasus. When the ownership of durable goods is defined as the possession of fewer than four of the nine items, 32% of the South Caucasus is materially deprived. Armenia has the lowest level of material deprivation at just under 19%, while Azerbaijan has a material deprivation rate of around 25%, and Georgia has a rate of 48%. 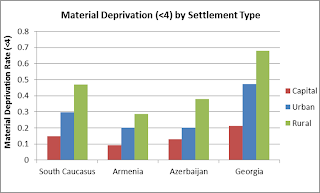 When the definition of material deprivation is expanded to include households possessing fewer than five of the household items, the material deprivation rate increases dramatically to 38% in Armenia, 47% in Azerbaijan, 64% in Georgia, and to 51% in the entire South Caucasus. Despite the percentile difference between the countries, living in a rural settlement and low education are similar characteristics shared by most materially deprived people throughout the South Caucasus. In the South Caucasus as a whole, as well as within each state, the capital has the lowest rate of material deprivation, rural areas the highest, and urban non-capital areas lie in between. For example, in the South Caucasus as a whole, only 15% of capital inhabitants own fewer than four of the items, while this figure is 30% for urban non-capital areas and 47% for rural inhabitants. Georgia and Armenia’s material deprivation rate in the capital is half that of urban non-capital areas, and one third that of rural areas. In Azerbaijan the biggest gap in living standards is between rural and urban non-capital areas, rather than between the capital and urban areas. In all three countries the rate of material deprivation in rural areas is over three times that of the capital. In addition to the high variance based on location, material deprivation is negatively correlated with the education level of the respondent. 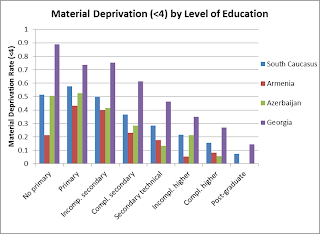 The material deprivation rate for people with only a primary education or less is over 50%, while it is only 16 % for people with completed higher education, and just 7% for those with post-graduate degrees. In fact, in Azerbaijan and Armenia, no survey respondents with post-graduate degrees and less than 8% of those with higher education are materially deprived. In Georgia, 15% of those with post-graduate degrees and 27% of those with completed higher education own fewer than four of the durable goods. However, these rates are still far below the country average of 47%. In each country and in the region as a whole, the achievement of at least a secondary technical education is the threshold for a lower than average level of material deprivation. Despite some trend-defying findings such as the relatively low rate of durable good possession for those with no education in Armenia, the overall trend in the South Caucasus clearly shows that a higher level of educational achievement corresponds with a lower rate of material deprivation. Moreover, a failure to move past high school education is linked with a higher than average risk of living in a materially deprived household.